Intel has confirmed that its seventh generation of Core processors are still on track to arrive in the second half of 2016. Speaking at Computex in Taipei, Intel said the chips — code-named Kaby Lake when they were first announced last July — are expected to launch in products by the end of the year, with production beginning this quarter. 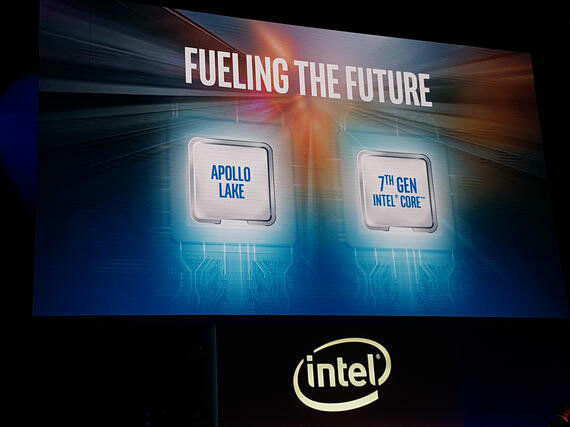 At the same time as it makes Kaby Lake chips available for desktop PCs, Intel also plans to launch its cheaper Apollo Lake processors, enabling features like USB-C in 2-in-1 devices and tablets. The company’s new 10-core i7 Extreme Edition chips might grab the Computex headlines for their “mega-tasking” abilities, but Intel says its forthcoming Kaby Lake processors promise advances in performance, battery life, and media capabilities, while also supporting functions like Windows Hello to make logging into your devices faster. The Kaby Lake processors will be Intel’s third 14nm chips to hit the market, marking a disruption to the company’s usual tick-tock pattern of chip release — the tick being the shrinking of the manufacturing process, the tock being optimization. Kaby Lake chips will be a third beat in this rhythm, coming after the launch of first Broadwell, and then Skylake 14nm chips. Intel’s upcoming CPUs will form a second optimizing “tock” before the company shrinks its chipsets further to 10nm in 2017. That shift has also hinted at a breaking of Moore’s Law, the theory developed by Intel founder Gordon Moore that manufacturers can double the number of transistors in a processor every two years. Speaking in 2015, Intel CEO Brian Krzanich said the company’s “cadence today is closer to 2.5 years than two,” as the company’s engineers reach the limit of what they can do with silicon. Intel didn’t provide an exact date for the arrival of its upcoming processors, but component manufacturer MSI is showing off a Kaby Lake-compliant z210 motherboard on the Computex show floor with a release date of November. Asus CEO Jonney Shih also made reference to using seventh generation Intel Core chips in his company’s newly announced Transformer 3 — set to arrive later this summer — but the new 2-in-1 will be using a Core M7 chip designed for mobile devices, rather than a full-fledged Core i7 processor. It’s not clear whether the Core M7 chip in question will be built around Kaby Lake architecture, or one of Intel’s earlier chipsets.